NVIDIA has recently launched the GeForce GTX 280 and GTX 260 video cards. 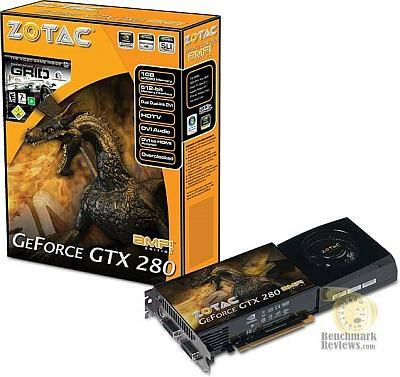 Both the GTX 280 and GTX 260 products position themselves at the most elite segment of the GeForce product line, so just imagine how much more powerful the GeForce GTX 280 could become after ZOTAC give it their special AMP! Edition treatment. The recent Radeon HD 4870 launch may have shown how close ATI/AMD can get to NVIDIA’s bar of performance, but the ZOTAC GeForce GTX 280 AMP! Edition graphics card has just raised that bar much higher. Benchmark Reviews tests the ZOTAC ZT-X28E3LA-FCP against the GeForce 9800 GX2 and 9800 GTX, as well as the new Radeon HD 4850 in CrossFireX configuration.